We would like to advise any supporters planning to travel by car tomorrow that they should allow additional time for their journey. This is due to the continued problems with migrant activity in Calais, which has led to the M20 being closed between J8 and J11. Whilst the route to Maidstone's ground takes you off at J6, supporters should be prepared for delays, particularly as it is a summer Saturday when holidaymakers will be on the road. There are no planned engineering works on the railways to Maidstone. David Shacklock is not a name that will resonate with modern-day Hendon supporters. Indeed he was not a stand-out player during his seven seasons with the Greens - and he was a first-choice regular in only two of those campaigns. He joined Hendon soon after playing for Cheshunt against the Greens when the Ambers produced a shock 3-2 win in the London Senior Cup in November 1964. He made his debut in in a 2-0 pre-Christmas victory at home to Hitchin Town, playing at right-back where he had been so effective as an opponent. But David's best position was centre-half, and Hendon had Geoff Riddy in that role in the season Hendon completed the double of Isthmian League Champions and Amateur Cup winners. Of course, these were days before substitutes, so David didn't appear at Wembley, or the League Play-off against Enfield at Dulwich Hamlet - or, indeed in the Middlesex Senior Cup final victory over Finchley - and he made just four appearances, all in the league, during the campaign. However, he did collect three winner's medals as Hendon Reserves swept the Isthmian League Reserve Division (the Greens lost once in the league all season), London Intermediate Cup and Middlesex Intermediate Cup. The following season, David broke into the first team and finished with 15 appearances, including in the Amateur Cup final at Wembley, where despite Hendon taking the lead through Riddy, Wealdstone won the trophy 3-1 (the previously-featured player in this series, Bobby Childs, scored twice for the Stones). The Greens also finished runners-up in the Isthmian League, two points behind champions Leytonstone (when there were still two for a win). For the 1966-67 season, the Isthmian League allowed substitutes to be named and David was the first Hendon player ever to wear the No.12 shirt - though he was not used (that honour went to Jimmy Quail). The Greens were in a state of transition and finished the season 10 points behind the champions Sutton United, and in fifth place. But this was also the season that David cemented his place in the team, as a centre-half - his best position. Riddy had moved on and he was the natural successor. The late 1960s was an era when most defenders stuck to their goal-stopping role and David's defensive reliability was further highlighted by the fact that he failed to score a single goal in more than 200 appearances. In 1966-67, David finished joint-top of the appearance-makers with 54, the same as David Hogwood, out of a possible 57. He played in all three matches in the epic and ultimately unsuccessful Amateur Cup semi-final against Skelmersdale, but won a first-team winner's medal for the first time as Hendon beat Enfield 3â2 on aggregate in the Middlesex Senior Cup. In both matches, he played as defensive midfielder, just in front of John Ashworth and Ray Poole. The following two seasons saw David play a little more than half of Hendon's first-team matches. In the 1967-68 seasons, he was restricted to just 22 games and it was 31 the following campaign. He played in exactly half of the Isthmian League games in 1968-69, but was a regular in cup ties, missing only three of 15. David played in every round of the London Senior Cup as Hendon won the competition for only the second time, beating Dagenham 1-0 in the final, thanks to a Rod Haider goal at Barnet FC's Underhill ground. His best season followed in 1969-70 when David again finished joint-top of the appearance-makers, this time with 57, the same as John Swannell. There was no silverware at the end of the season, and the Greens finished fifth in the Isthmian League, a dozen points behind champions Enfield, but Hendon did take Millwall to a London Challenge Cup replay and reached the second round proper of the FA Cup. David's contribution did not go unnoticed, by Hendon fans at least, because he was named the Supporters Association Player of the Year in 1970. That summer John Evans arrived as manager and started to rebuild the team. One of those whose chances became more limited was David Shacklock, who played in only 32 matches, including three as a substitute. In the summer of 1971, Alan Phillips was signed to be the centre-half and that was the signal for David to move on, joining Kingstonian. While David didn't win international honours at Hendon, his daughter Kerry competed at the Barcelona 1992 Olympic Games, finishing sixth in the duet class of the Synchronised Swimming competition. She was also, briefly, the girlfriend of world record javelin thrower Steve Backley. The draw for the Ryman Youth League Cup has been made and we have been drawn away to Wealdstone in the first round. The tie is scheduled to be played on Wednesday 16th September. The draw for the preliminary round and first round of the Robert Dyas (Isthmian) League Cup has been made. We have been drawn away to Molesey, who play in Ryman League Division One South, with the tie to be played on Tuesday 18th August. We now have season ticket and sponsorship forms available for all our forms of sponsorship for the new season. As previously noted, we have held all prices for the new season and are offering some excellent value packages. The forms can be found below and will shortly also be downloadable from the individual sponsor pages around the website. The first team won Gary McCann's testimonial match tonight, beating a young QPR side 4-3 at Earlsmead. In a thoroughly entertaining game, it was Andre Da Costa who struck first to give the Greens the lead, before Axel Prohouly equalised on the half hour mark. Nicu Hamailnen put the R's ahead on 51 minutes, but very soon afterwards Mahrez Bettache restored parity. Sam Murphy put the Greens ahead in the 68th minute, only for Olamidhe Shopipo to equalise for the visitors, but Elliott Brathwaite ensured it was a night to remember for Gary McCann as he scored the winner five minutes from time. Our planned friendly against Fisher at Champion Hill has been cancelled as the ground is now unavailable on Thursday evening. We are actively looking for an alternative game, and will of course let you know should we be able to arrange one. Don't forget that Gary McCann's testimonial match against a QPR XI takes place tomorrow evening at Earlsmead, kick off 7:30pm. This is our opportunity to show our appreciation for Gary's efforts for the club over the past 18 years, both as goalkeeper and manager. Entry for the game is on a pay what you want basis - so it is very much up to you what you pay, full in the knowledge that all the proceeds will be going to Gary. We hope to see as many of you as possible at Earlsmead tomorrow for what promises to be an entertaining evening. The subject of this feature is one who died tragically young, Bobby Childs. Bobby Childs' statistics don't tell the true story of his contributions to Hendon. The only competition he didn't win in six seasons at Claremont Road was the London Senior Cup, but he did get a runners-up medal in 1972 (Bobby had left Hendon much earlier in the season the Greens won the League Cup, the first season they entered the competition). He also played in the Hendon teams that drew at Newcastle United in 1974 and beat Reading in 1975. Bobby never led the club in appearances or goals but was second-top goalscorer in 1975-76. Before he joined Hendon, Bobby won an FA Amateur Cup-winners' medal in 1966, scoring twice for Wealdstone in the final against Hendon at Wembley. A case could be made that Bobby was the final piece in the jigsaw as John Evans moulded one of the most dominant teams of the time. In modern terms, Bobby would be considered a winger or wide midfielder, having previously been more of an old-fashioned inside forward in the 1960s. Slope-shouldered, short and stocky, Bobby wasn't a will-of-the-wisp winger, but he combined great ball-control and strength with the ability to beat a defender inside or out and then deliver a dangerous cross. He was also a set-piece expert, either from the corner quadrant, from free-kicks or the penalty spot. From 12 yards, Bobby combined both power and placement; the one time it didn't work was an FA Trophy tie against Kettering Town in 1976, but the referee ordered the kick to be retaken and Bobby made no mistake second time around for the game's only goal. Bobby's debut came against Hitchin Town in October 1971, a 2-0 victory, by which time Hendon had completed a large chunk of their League fixtures. He finished the season with 40 appearances, 19 of which came in cup-ties, including the finals of the FA Amateur Cup, London Senior Cup and Middlesex Senior Cup. He contributed five goals, three in knock-out matches, including the opener in the Amateur Cup semi-final against Wycombe Wanderers at Brentford and in the Middlesex Senior Cup final against Enfield. Bobby also scored in the Barassi Cup first leg against UC Valdinievole in autumn 1972. The 1972-73 season was the second most prolific of Bobbyâs Hendon career as he netted 12 goals in 51 appearances and claimed Isthmian League and Middlesex Senior Cup winners' medals. Hendon couldn't repeat their League glory in 1973-74, but they more than made up for it in the FA Cup where victories over Barnet, Leytonstone and Merthyr Tydfil set up a third-round tie against Newcastle United. More than 30,000 watched the game at St James's Park, where Alan Kennedy had a torrid afternoon trying to keep Bobby quiet. A 1-1 draw led to a replay at Vicarage Road, Watford, and Newcastle made no mistake second time around, winning 4-0. A combination of long cup runs and power supply problems meant that midweek games were largely impossible during the winter months, which led to fixture congestion, and Hendon - worse affected than most - finished two points behind champions Wycombe. The only consolation was a third straight victory in the Middlesex Senior Cup final, this time against Edgware Town. The offseason saw almost all of the great team move on to pastures new and Bobby was one of those to go, returning to St Albans from where he had joined Hendon three years earlier. However, he returned to Claremont Road in February 1975, where finished the campaign with six goals in 14 appearances. Bobby might have made the difference in the Middlesex Senior Cup, where Hendon reached a fourth consecutive final, but the arcane qualification criteria of the time meant he was ineligible and the Greens lost in a replay to Staines Town. Saturday 22 November 1975 is etched in Hendon history as the day the Greens first beat a Football League club in the FA Cup. Bobby was fouled on the halfway line at Claremont Road, Dave Metchick took the free-kick, John Baker flicked it on and Alan Phillips scored what proved to be the only goal against Reading. The following spring, Bobby won a Middlesex Charity Cup winners medal as Wembley were beaten 1-0 at Claremont Road. From a personal performance point of view this was possibly his best season, as 17 goals from 54 appearances and the Supporters Association Player of the Year award attest. It was also Bobby's last full season at Hendon as he left the club after making just 10 appearances in autumn 1976. Tragically, Bobby developed leukaemia, which claimed his life in his early 40s, a few years later. The Supporters Association and Supporters Trust held their AGMs at Silver Jubilee Park on Wednesday evening before Simon Lawrence and Rob Morris signed the ten-year lease. The Supporters Association announced that Geraldine Clarke was standing down as treasurer following many years of distinguished service and that Graham Rice would step into the role for 2015/6. Geraldine will remain on the committee. John Rice is also stepping down as secretary and the committee having played a pivotal role in bringing the Association into the 21st century with an on-line shop, social media presence and many other innovations. In the chairperson's remarks, Sandra paid tribute to the efforts of the committee and Geraldine and John. She asked that anyone interested in taking on the position of secretary to speak to her, or any member of the committee at future home games. This was followed with a plea to all supporters to become members of the Association in 2015/6 to ensure the association, which has been in existence for more than 80 years, can go from strength to strength. This was followed by the Trust AGM at which chairman Bryan Roberts echoed many of Sandra's comments whilst adding that even though we are potentially on the cusp of securing the club's longer term future with SJP, we could not afford to become complacent and take our foot off the pedal. There was lots of hard work to do to secure funding to allow the club to continue competing at this, or a higher level. John Rock was re-elected to the Trust board and Tom Stockman was elected. There were no resignations. For those who don't know Tom, he is the facilities manager at Silver Jubilee Park, and he has been working extremely hard with Rob Morris over the past couple of years. The evening ended with remarks from club chairman Simon Lawrence. The two main points that he was keen to emphasise was that there is no white knight prepared to pay the bills and that this is solely down to what we, the supporters are able to do. The need for donations, membership renewals and fundraising was as great now as it was ten years ago. One of the overrriding themes from both the Association and Trust AGMs was the dwindling number of memberships. A plea was made from Simon to anyone that thinks of themselves as a supporter of Hendon Football Club to pay the ÃÂ£10 for membership of the Trust. There should be no greater incentive for supporters to become members than to be a part owner of this great club. With attendances increasing last season, it is hoped that we would see membership of the Trust and Association grow over the next 12 months. Finally, after paying tribute to everyone from the Graham Etchell, the management and players right down to the supporters and matchday staff for their part in Hendon's best season of the semi-professional era, the evening ended with the lease on SJP being signed. There were plenty of positives to take away from today's 3-1 friendly defeat at Eastbourne Borough. Apart from a ten minute spell at the end of the first half, the Greens more than matched their opponents who finished in the top half of Conference South last season. Eastbourne took the lead in the 26th minute through Elliott Romain, despite the Greens having some very good spells of play during the first half. However, the home side took the game away with goals from Darren Lok and Kane Haysman, leaving Hendon rueing some poor defending from set pieces. The second half saw the Greens be on top for much of the half, with Aaron Morgan finishing off an excellent chance clinically. With Sam Murphy, Scott Shulton and Mahrez Bettache causing the home defence no end of problems, the Greens were a touch unfortunate not to score another goal. Next up is Gary McCann's Testimonial Match on Tuesday evening at Earlsmead, kick off 7.30pm. Remember that this is a pay what you want game. The club have today confirmed that both Belal Aite-Ouakrim and Chris Seeby have registered for the new season. Belal, who missed much of last season through injury, returned to action on Tuesday evening against Haringey Borough, whilst Chris has had a successful knee operation, and is now on the road to recovery, targeting a return around Christmas. We are delighted to announce that Eskinazi & Co have agreed to renew their shirt sponsorship for the 2015-16 season. Eskinazi & Co are solicitors who are based in North Finchley, and this is their third season of sponsorship of the club. We would like to take this opportunity to thank Eskinazi & Co for their continued and invaluable support, and we look forward to seeing them at games once again this coming season. The admission prices for the Isthmian League Charity Shield game against Maidstone United on Saturday 1st August have been announced today. Prices are Â£6.00 for adults, Â£4.50 for concessions, Â£2.50 for 11-16 year olds, and free for under 11s. The proceeds from the game will be split between charities chosen by both ourselves and Maidstone United. As a reminder, the game is being played at Maidstone United's ground, and will kick off at 3:00pm. We are pleased to announce that player, match and matchball sponsorships are now available for the new season, together with a new programme sponsorship package. The new programme sponsorship package costs just Â£30 and entitles you to a free programme, free entry to the game, and your name on the front of the programme. The Ryman League have released the fixtures for the Ryman Youth League, and the opening fixture will be a home game against Aldershot Town on Wednesday 26th August. All home games will be played at Silver Jubilee Park on Wednesday evenings, with the day of away games varying depending on our opponents. As well as the league, the Under 18s will be taking part in the FA Youth Cup, Ryman Youth League Cup and the Middlesex County Youth Cup. 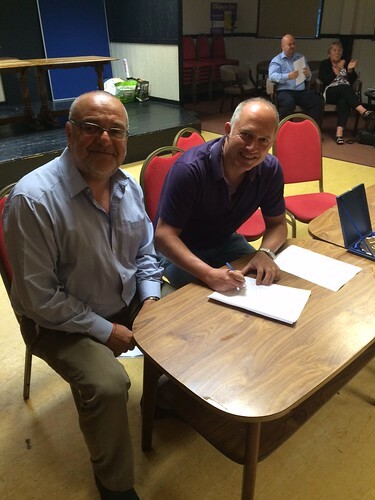 At last night's AGM evening, Simon Lawrence and Rob Morris signed a 10 year lease for Hendon FC to play at Silver Jubilee Park rent free. The expectation is that this will cut operating costs for the club by somewhere in the region of Â£25,000 per season. Whilst there is a lot of work to be done at SJP to ensure we can play there, hopes are high that the work can be done to ensure that we can start the 2016-17 season at our new home. The first team continued their pre-season preparations this evening with a 2-2 draw against Haringey Borough. It was the visitors who had the best of the first half as they scored twice, but two goals from Jake Cass pulled the Greens level in the opening 15 minutes in the second half. Next up is a seaside trip to Eastbourne Borough on Saturday afternoon, kick off 3pm. Dave Anderson was on not at the game when Eugene Ofori made his first Hendon appearance, in a friendly at Claremont Road against Yeading in August 2001. Assistant manager Jon Turner, the former Yeading boss, took one look at the stocky striker, who had played in the Ghanaian top division as well as trialling with Watford, and nicknamed him "Yeboah", because of the physical similarities between Ghanaian compatriots Ofori and Tony Yeboah, then one of the most exciting strikers in the Premier League. Eugene's debut was brief â and as a substitute â and he did not actually appear in a competitive match until late September, coming off the bench late in a 3â1 defeat against Canvey Island. For a player who scored a goal every 2.76 appearances, it is surprising that he failed to register until his 10th game, a Middlesex Senior Cup tie at Kingsbury Town. Eugene also finished the season with an eight-game goalless run. He was used strangely in the campaign, coming off the bench 13 times in 28 League matches, but starting 11 of 12 cup-ties. But it was a successful season for Hendon in that there was silverware at the end of it in the shape of the Middlesex Senior Cup â Anderson's teams won the trophy in all three seasons he was Hendon manager. The first final was a thriller against Northwood, at Church Road, Hayes, and the Greens won 4-2 after extra-time. The following season, capped by a Middlesex Senior Cup victory over Enfield Town at Northwood, in which Eugene scored the decisive second goal just before half-time, followed a similar pattern to 2001-02, because while Eugene was an almost ever-present in cup-ties - starting 13 times in 15 appearances - but 15 of his 35 League games were as a substitute. More importantly, he was a big contributor of goals, grabbing 17, four behind top-scorer Ricci Crace. The best of Eugene's four seasons at Claremont Road was in 2003â04, when he averaged a goal every other game and appeared in 54 of the Greens' 57 games. He netted seven times in eight cup starts but more laudably managed 20 in the Ryman League, always a benchmark for a striker, irrespective of a season being 38, 42 or 46 matches. Eugene was again on target in the Middlesex Senior Cup final, grabbing the first goal in the 3-1 extra-time victory over Uxbridge at Yeading. In a spell of eight games from the first weekend of February to the first weekend in March, he scored eight times, helping Hendon to an unbeaten run of 16 matches. Hendon fans recognised Eugene's contributions and he was the easy winner of the Supporters Association's player of the year award. The Greens would have finished second if they had done better in their final four matches as they slipped from second to fourth in the table, but part of the dip in form could be attributed to the rumours surrounding the regarding Anderson's future - he would join AFC Wimbledon - and the promotion to the newly-formed Conference South. It was all change in 2004-05 as 13 members of the Hendon playing and management staff moved to Kingsmeadow. More importantly the club decided not to take their place in the new second tier of Non-league football and had to find a new manager from outside, something that had not happened since March 1997. Tony Choules, from Northwood, was selected to take charge of team affairs and Eugene was one of the few players to remain loyal to Hendon. Although the season started well, things fell apart after the embarrassing FA Cup defeat at Stevenage Borough and Choules' immediate departure. Choules' assistant, Gary Farrell was the new manager and he oversaw a catastrophic January which saw exits from four cup competitions and 32 goals conceded. Farrell was sacked after three months as the Greens lurched towards relegation - they had been top of the table in September! Gary McCann became the third manager of the season on and he steadied the ship, seeing Hendon safely avoid relegation. Only goalkeeper Dave King and centre-back Rene Street made more than Eugene's 47 appearances, but Ofori's 14 goals were a distinct drop from the previous season. Hendon opened the 2005â06 season with a trip to Braintree Town. The Iron wasted little time in putting in an approach to sign Eugene, and his final Hendon goals before moving to Essex came in his penultimate appearance - a double in the famous 5-4 win at Wealdstone. The club have announced today that former Brentford U21 keeper Melvin Minter has joined the squad. Melvin, who appeared for Canvey Island and AFC Hayes last season, has played in all three friendlies so far this summer and will be challenging Joe Wright for the number 1 shirt at the start of the season. Supporters planning to travel to Needham Market on 22nd August are advised that there are currently cheap advance fares available on the 12:00 and 13:00 departures from Liverpool Street to Needham Market (changing at Ipswich) for Â£9.00 each way - resulting in a saving of Â£23.00 on a standard return ticket. The station is about a half mile walk from the ground. These tickets are available through all major train ticket booking platforms, or at any National Rail station. Supporters are advised to buy tickets as soon as possible as advance fares are limited in supply and prices will rise when quotas have been sold. If booking online - please go to our EasyFundraising site first, and select one of the train ticket booking sites to earn money for the club. Supporters planning to travel to Eastbourne Borough on Saturday are advised that there are currently cheap advance fares available from London Victoria to both Eastbourne and Pevensey & Westham stations - priced at Â£11 for the outward journey, and Â£8 for the return journey - resulting in a saving of over Â£12 on the standard return price. Pevensey & Westham station is about a 15-20 minute walk from the Priory Lane ground, or alternatively you can travel to Hampden Park or Eastbourne stations and catch the LOOP bus which operates to Priory Lane every 15 minutes. If you'd rather use a taxi, Eastbourne Borough recommend 720720 taxis who are contactable on 01323 720720. The first team were beaten 4-2 by a strong, competitive St Neots Town side this afternoon. On a beautiful carpet of a pitch, the Greens were left rueing some uncharacteristic defensive sloppiness as they went two goals down early on, Ryan Hawkins and Remi Gordon scoring the goals, before Tom Meachin made it 3-0 shortly before half time. Hendon had been positive going forward, and tested the keeper a couple of times. Hendon pulled themselves back into the game in the second half with an improved performance, and it was Jake Cass who fired home a fine effort from the edge of the area. Just a few minutes later Sam Murphy made it 3-2 with an even better effort, but in the 73rd minute Ollie Thorne put the home side two goals to the good with an absolutely stunning strike from some 40 yards that screamed into the top corner of the net, giving Melvin Minter no chance. The subject of this feature is another of the many players who had more than one spell at Hendon, midfielder Jon Daly. The signature of Jon Daly, in autumn 1992, wasn't down only to one of his closest friends in football, Barry Blackman - who had been with the Greens since the start of the season. Club manager Barrie Williams was far too astute to sign someone on the say-so of a player - but he did have a staunch ally. Daly and Blackman had been teammates at Croydon when that club had the best youth policy in south London non-League football. Jon first joined Hendon from Dulwich Hamlet, having previously played for Croydon, Tooting & Mitcham United and Whyteleafe. In May 1991, he was in the Sutton United team which played Wealdstone in the final senior match at Lower Mead; a decade later he was in the Hendon team when they played the final senior match at Enfield's Southbury Road ground â a unique if ghoulish double. Jon was a powerful attacking midfielder with a good eye for goal, as a strike rate of a goal every 7.8 matches proves. His strength and fitness were excellent attributes, especially at Claremont Road around the turn of the century, when the pitch was in an awful state. Although not the fastest player around, he had the happy knack of appearing in the right place at the right time; his positional sense was also displayed on the odd occasion when he played in the middle of the back four. Jon's debut, against Basingstoke at Claremont Road, ended in a goalless stalemate, and his first goal came in a 2-2 draw at Wokingham in his fourth match for the Greens. Hendon rather went off the rails in the second half of the season; Williams departed in the spring of 1993 and Bobby Makin took over for the rest of the campaign. Jon netted all of Hendonâs last three goals, but none were in a winning cause and only one earned as much as a point. Peter Taylor took over in May 1993. It might have been a new dawn at Claremont Road - except Taylor left at the beginning of December and at the end of the month, chairman Victor Green pulled out too. He installed his wife Elaine as his replacement, with a massively reduced budget. Almost immediately, the team broke up and Jon moved on. He played for Kingstonian and St Albans before, in the summer of 1998, Hendon manager Frank Murphy, re-signed Jon for a four-figure transfer fee. He joined a team which had been installed as pre-season favourites for the title, based on a great finish to the previous campaign. Those notions were disabused on the opening day when newly-promoted Hampton won 3-1 at The Beveree, but Hendon were a potent force with Paul Whitmarsh and Junior Lewis amassing 70 goals between them. Jon had one of his quieter seasons in terms of goals with only five in 58 appearances, but he did win both Middlesex Senior and Full Members Cup winners medals, after defeats of Wembley at Enfield and Worthing at Sutton. He also appeared in the FA Cup run to the first round proper, where Notts County won in a replay at Meadow Lane after a goalless draw at boggy Claremont Road. But Hendon under-performed in the Ryman League, and managed only a disappointing 13th place, 20 points away from both second top and second bottom. In 1999-2000 Jon's performances earned him the Supporters Association Player-of-the-Year award - an honour he achieved at his last three clubs. He missed only one league match and finished with 55 appearances, including in the 2â0 defeat in the FA Cup second round at Blackpool. This was Jon's last full season as a Hendon player although he did play in the first and last games of the 2000-01 season. He had joined the Metropolitan Police â the third serving officer at Hendon, alongside on-loan keeper Richard Wilmot and defender Paul Towler. Jon's 36 appearances were his fewest in any of his last 12 senior seasons, during which time he played 617 times. Jon's final appearance at Claremont Road came four days after his 38th birthday, 24 September 2005, with his final club, Metropolitan Police FC, in an FA Cup tie the Blues won after a replay. He did not retire until April 2008, having - almost certainly - appeared in more than 1,000 senior matches. Oh yes, in December 2013, Jon played and scored for Met Police Vets! The subject of today's feature is one of only two Hendon players to score the winning goal for the club in FA Cup ties against Football League clubs. On 22 November 1975, Alan Phillips added his name to the pantheon of Hendon greats. It was his header, from a Dave Metchick free-kick, past Reading goalkeeper Steve Death, that gave the Greens a 1-0 win, their first ever FA Cup victory against Football League opposition. But that is getting ahead of ourselves, because it came in Ala'âs second spell, and the last of his four seasons at Claremont Road. Alan first joined Hendon from Isthmian League rivals Tooting & Mitcham United at the start of the 1971â72 season. At 25 years old, he was an experienced player, with four Wales Amateur international caps to his name - earning two each at Tooting and Barry Town. Alan was a clever centre-half, not particularly robust in build, but good enough to keep taller players quiet in an era when challenges were distinctly more physical and referees more lenient. In Alan's first season, Hendon finished nine points behind champions Wycombe Wanderers, but they did beat them 2-1 in a memorable FA Amateur Cup semi-final. In the final, Hendon met Middlesex rivals Enfield at Wembley. Alan, and the rest of the Hendon defence, were magnificent as they kept Enfield out as the Greens won 2-0. It was not Alan's only winner's medal that season, as he also played in Hendon's Middlesex Senior Cup triumph against Hampton - and Enfield denied him and the Greens a treble by winning the London Senior Cup final. Alan, who worked for Heinz, had his football exploits publicised in an illustrated feature in the company magazine. Hendon's defence in 1972-73 was arguably the meanest in Isthmian League history and it was the Greens' proud boast that none of the 18 goals they conceded in 42 league matches came from a corner. Hendon raced to the championship and did not lose a league game until 17 April 1973 (ending a run of 13 straight league wins which had begun on 25 November and had seen just two goals conceded). Stability was key and between goalkeeper John Swannell, the regular back four of Alan, Tony Jennings, Gary Hand and Peter Deadman and the two central midfielders, Phil Fry and Rod Haider, just three cup-ties were missed between them. Many more league games were missed, but clashes with internationals made that inevitable. Alan won his last two Wales Amateur caps during his first two Hendon seasons, including one in 1972-73 (as an aside, Wales's final ever amateur international came on 23 February 1974, the day Hendon entertained Leatherhead in the Amateur Cup and while Alan put club ahead of country, future Hendon manager Gwyn Walters, then at Barking, did play in the game). Hendon won two other trophies that season: in October, as the Amateur Cup winners, they played Italian side Unione, for the Barassi Cup and won 3-1 on aggregate; then, in May, retained the Middlesex Senior Cup, beating Enfield in the final. Alan missed only one of 67 matches in 1973-74, the season in which Hendon hit the national headlines by holding Newcastle United to a 1-1 draw in the FA Cup third round. In the previous round, Alan was on the scoresheet in his homeland when Hendon won 3-0 at Merthyr Tydfil. Only a crazy run-in to end the season - Hendon had played nine FA Amateur Cup ties, but drew six of them - saw the Greens end up two points behind champions Wycombe. More importantly, it was the end of the amateur era, and while clubs such as Wycombe and Enfield spent heavily on players, Hendon were more frugal - the upshot of which was wholesale departures, Alan included, from Claremont Road. A move to Wycombe brought Alan more FA Cup glory as the Chairboys held top-division Middlesbrough - managed by World Cup winner Jack Charlton - to a goalless draw before losing the replay 1-0 on their sloping Loakes Park pitch. A year later, Alan was back at Hendon and the Greens reached the FA Cup second round, where Swindon won 1-0 at Claremont Road thanks to a late penalty. In the previous round, Hendon had been drawn at home to Reading. The Biscuitmen - as they were known in those days â were riding high at the top of the old Fourth Division, but Hendon matched them in every department and Alan's headed goal proved to be the only one of the match. The Greens finished the season in sixth place, with Alan having played in all 42 matches - he missed just one cup-tie - and added the Middlesex Charity Cup to his already large collection of medals. He scored the last of his 11 Hendon goals in his penultimate appearance for the Greens, the consolation in a 3-1 defeat at Woking. The First Team's full league fixture list for the 2015-16 season is now online on the fixtures page. The Ryman League have issued the fixtures for the new campaign this morning, and we will begin on Saturday 8th August with a trip to Grays Athletic. Our first home game is on Monday 10th August when we entertain Enfield Town, and on Saturday 15th August we host Dulwich Hamlet. We venture into new territory on Saturday 22nd August when we travel into East Anglia to play Needham Market, and two days later East Thurrock United are the visitors to Earlsmead. The August Bank Holiday weekend sees us travel to Leiston on Saturday 29th August, and then host Harrow Borough on Monday 31st August. Our Boxing Day game is our away fixture against Harrow Borough, and then on Saturday 2nd January we are at home to Wingate & Finchley. The full fixture list will be put on the website this evening. Our new under 18 side will be hosting a friendly against Ritsumeiken Academy from Kyoto in Japan in a fortnight's time. The game will take place at Silver Jubilee Park on Wednesday 29th July with a 6.00pm kick off. This will be a great opportunity to see our talented players of the future and show them our support. You can now see all the latest news from the Under 18s, along with their fixtures, result and the league table by selecting Under 18s under the Youth & Reserves drop down menu. The club's impending move to Silver Jubilee Park has been featured in an item on the Wembley National Stadium Trust website. We are pleased to announce that Scott Shulton has registered for us for the new season, to begin his fourth spell with the club. The 25 year old midfielder had two loan spells whilst he was with Wycombe Wanderers, and then had a third spell for six months from March 2011, before he joined Wingate & Finchley where he has been since. So far, Scott has made 34 appearances, scoring 5 goals, and we look forward to seeing him back in the side during the coming season. The first team picked up a second 4-1 win of the summer, this time at Tring Athletic on a warm but cloudy evening. As with Saturday, the first half was goalless, but this time it was the Greens who took the lead when a cross from Jake Cass was diverted into the net by a Tring defender. Tring then equalised from the penalty spot, but two goals from Lee O'Leary and a late goal from Sam Flegg completed the win. Coming up next is a trip to St Neots Town on Saturday afternoon. Erskine Smart made a couple of appearances for Hendon at Under-18s level, before becoming a regular in the reserve team. In October 1985, manager Gary Hand gave 21-year-old Erskine his first-team debut in the Isthmian League Cup away at Feltham. It was a banana-skin tie against a mid-table Isthmian League Division Two South team at Feltham Arena, a windswept athletics stadium with an Astroturf pitch. Erskine played on the right side of midfield with future Fulham regular Richard Langley behind him. The Greens were struggling near the foot of the table and eventually saw off their hosts 3-1 after extra-time, with Erskine scoring Hendon's first goal thanks to a spectacular long range strike. His League debut followed week later, but there was little to celebrate as Farnborough Town recorded a 5-1 win at Claremont Road. Langley soon moved on - to Corinthian-Casuals from where he made the step up to the pros - and Erskine, became the regular right-back, and he finished the season making 30 appearances, including in the Middlesex Senior Cup Final victory over Southall at Enfield's Southbury Road ground. He was also at right-back the night Hendon achieved Premier Division safety with a 4-1 last game victory at Slough Town, a night indelibly etched in the memory of every Hendon fan who was at Wexham Park. Erskine's second goal came in September 1986, in the FA Cup, in very strange circumstances. Banstead Athletic were first-qualifying round visitors to Claremont Road when, midway through the first half, Athletic's centre-half was escorted from the pitch, and - in full kit - taken to a waiting car. He wasn't being arrested, but had just been informed that his house was on fire! With no time to prepare a substitute for action, Banstead were down to 10 men as Hendon took a corner, from which Erskine netted. This was Hendon's longest season (comprising 76 matches), and Erskine made 59 appearances, all but one as a starter. He also collected runners-up medals in both the AC Delco (Isthmian League) and GMAC (Premier Inter-League) Cups, after defeats against Bognor Regis Town and Kettering Town, respectively. The late 1980s were nothing if not eventful for Hendon FC. In 1987-88, Erskine started all 42 Isthmian League matches. He also played in a number of memorable cup ties that year, including the 4-2 reverse at Elm Park, when Reading won in the FA Cup first round proper. Six and a half months later, Hendon were at Wembley Stadium, playing in the Russell Grant Middlesex Charity Cup Final, against Wembley. Erskine collected his second - and final - winner's medal at Hendon, as the Greens won 2-0 in their last appearance beneath the famous Twin Towers. Erskine was an old-fashioned full-back in that he was a defender first and foremost, though he was more than able to provide width on the overlap. He had great speed, which meant few wingers were able to get past him, and his time and tackling techniques made him one of the best full-backs in the Isthmian League. Erskine missed only four League matches in 1988-89, a season which started brightly and ended with the club in disarray, especially off the field. The following season saw the Greens slide backwards as key players were allowed to leave, mainly to balance the books. Erskine, being one of the most valuable assets was one of the first to go, leaving at the start of December. He went on to play for Enfield and St Albans, amongst others - and as recently as spring 2014 - was named by many Saints fans in their all-time team. After more than six years away from Claremont Road Erskine was one of the first of the myriad signings by Neil Price as he desperately tried to keep Hendon in the Premier Division. Erskine's second debut was in a 3â0 home defeat at the hands of Kingstonian, and this second spell, like so many of Price's signings, was brief. Playing now at left-back, instant results were demanded and two draws in five matches was not considered good enough. It says more about Price's panic than anything else that after five games, 31-year-old Erskine was replaced in the No.3 shirt by Michael Gonzague. After leaving Hendon for a second time, Erskine moved into coaching and worked at Yeading. In 2010, he ran in the London marathon and two of those who sponsored him were long-time Hendon team-mates Dave Root and Colin Tate, the latter posting a message on his Just Giving messageboard "Good luck Skinhead. Pace yourself son, and then crash it up the channel!" It was a good first workout of preseason at Silver Jubilee Park this afternoon as the first team ran out 4-1 winners against Northwood. The Hendon line up fielded a few trialists, including potential returnees Jamie Busby, following a three year break from the game, and Scott Shulton. Other trialists were Melvin Minter, a keeper formerly with Hayes & Yeading United and Brentford U21s, Courtney Harris a midfielder from Fulham, Jake Cass, a forward who has previously been with AFC Hayes and East Thurrock United, Freddy Champion who has been on the books of QPR, Chelsea and Spurs, Melvin N'Somi and Denis Meta. All the goals came in the second half, with Max Holland giving Northwood the lead, before Andre Da Costa hit a hat-trick, including a penalty, and Aaron Morgan completed the scoring with an excellent strike from 20 yards. Next up is a trip to Tring Athletic on Tuesday evening. We are pleased to announce that admission and season ticket prices for the 2015/16 season remain unchanged. Admission will be £10 adults, £5 concessions and £1 for under 16s (under 5s go free). Season tickets will be £160 adults, £85 concessions and £10 for under 16s. Application forms for season tickets are not yet available, but if you would like to buy one, please email the website on admin@hendonfc.net and we'll put you in touch with the relevant people. The subject of this feature is first team coach Scott Cousins, who is still registered as a player, although his appearances are sporadic. Scott joined Hendon from Chelsea in the summer of 2003, having found his path to the first team blocked by a multitude of internationals. He did have Hendon links as his father, also Scott, had made a handful of appearances for the reserves. His first manager at Claremont Road was Dave Anderson, who was aware of Scotts fiery reputation and I remember Dave telling me of a conversation he had with Scott when he had been with the club a few weeks  Scott missed the season-opener serving a suspension from the previous campaign. "Who is the better player, you or me?" Dave asked. "Me," replied Scott. Dave then asked, "If you are suspended and sitting in the stands, who is the better player?" The message got through, loud and clear. In his first season at Hendon, Scott was an attacking left-sided player, who could beat a player on the inside and outside, then deliver a telling cross. He was also a superb striker of the ball, either in live play or from a set-piece. He scored and created numerous goals as the Greens finished fourth in the Ryman League Premier Division, only missing out on second place in the final week of the season. Scott scored eight goals, including a few penalties, in 51 appearances that season, both third-best at the club. One goal which stood out was at Northwood when, kicking up the hill towards the cemetery, he struck a 25-yard drive and buried it in the top corner of the goal. He then added a second half penalty in a 2-0 win. Hendon finished the season as Middlesex Senior Cup winners. At the end of the season, Dave's team moved en masse - 13 players and staff in total - to AFC Wimbledon, but not Scott. He played in the first preseason friendly, before signing for St Albans City, who he helped rise to the Conference National. Sadly, Scott's career was derailed by a badly broken leg which he suffered playing for St Albans and he missed significant time. He left the Saints and signed for Carshalton Athletic in the summer of 2009, but returned to Hendon, now at Vale Farm, in October that year, making his second debut against Lowestoft in the FA Trophy, a 2-0 Greens victory. Scott was a different player now, certainly less combative, but smarter and still able to find teammates with passes few others would have even seen, let alone attempted. He was also regularly on the scoresheet, with five goals in 35 appearances. The 2009-10 season was an unusually barren one for Hendon whose interest in all cup competitions ended in the quarter-final of the London Senior Cup, but a comfortable mid-table finish of 10th was satisfactory after a disappointing first three months. In 2010-11, Scott played a big part in Hendon's run to the FA Cup first round - the Greens went down 3-2 away to Chelmsford City - but he did pick up a runners-up medal in the London Senior Cup. The season started very promisingly and the play-offs seemed a possibility, but injuries meant the Greens coasted through the second half and finished in lower mid-table. Scott was appointed captain for the 2011-12 season and his leadership certainly helped the team. The arrival of Darren Currie gave the Greens a magnificent left-wing combination and it was little surprise that Hendon enjoyed a much better season, missing out on the play-offs by just three points, despite amassing a tremendous 72. Scott also had the honour of lifting the London Senior Cup after a comfortable 2-0 victory over Kingstonian at Imber Court. Scott also scored to date his last Hendon goal, at Lewes. A rare moment of madness denied Scott the chance of leading out Hendon in the first round of the FA Cup at League Two Aldershot Town. He was sent off in the third qualifying round replay against Eastbourne Borough and was suspended for the tie at the Recreation Ground. Scott made 36 appearances in the League that season, but struggled with a groin problem that he could not shake off. This injury did not heal during the summer and Scott was limited to just five appearances in 2013-14, though his mentoring of Jack Bennett certainly made a difference to his career. When Junior Lewis left the Hendon coaching staff, Gary McCann had no hesitation in promoting Scott, a few weeks short of his 31st birthday, to the role of coach. The Annual General Meetings of the Supporters Association and Supporters Trust will both take place on Wednesday 22nd July at Silver Jubilee Park. As in previous years, the evening will begin with the Supporters Association meeting, and after a short break will be followed by the Supporters Trust meeting. The meetings are only open to members of the respective organisations. This Green & Gold is about two players, whose similarities ended with wearing the green shirt with distinction, dark hair (very different styles) and the same name. Peter Anderson, the winger, was one of the last amateur players to leave Hendon for a career in the professional game - and he made a huge success of it, at Luton Town and Sheffield United, as well as spells in the USA and Belgium. He joined Hendon as a 19-year-old from Barnet, and made his debut on the opening day of the 1968-69 season. He scored his first goal in the next game, a 1-0 win at Ilford. Tony Harding had left the club in the offseason after scoring 61 goals in 85 appearances, but Peter was not a straight replacement for him, being much more a creator of chances than an out-and-out finisher. Hendon had their worst finish in the Isthmian League in 1968-69, sixth place, but Peter made only 28 League appearances. It was a different story in cup competitions, the highlight of which was the London Senior Cup final at his old hunting ground, Underhill, where Hendon beat Dagenham 1-0. In 1969-70, Hendon came close to another Football League scalp with a 2-2 draw against Millwall in the London Challenge Cup. Peter didn't score against the Lions, but he had done when Barnet were beaten 2-0 in the previous round. Another disappointing League campaign was more than compensated by cup success as the Greens reached the second round proper of the FA Cup. Peter scored in all but two of Hendon's seven ties, including a hat-trick in the 7-2 second round qualifying replay demolition of Rainham Town at Claremont Road. In all, Peter missed just three of 58 matches and scored 24 times. There was talk, even at the start of the 1970-71 season, of Football League clubs trying to sign Peter. He continued to contribute to the Greens' cause, scoring the first goal in a 2-1 victory at St Albans City which took Hendon into the FA Cup first round proper, where Aldershot won 2-0 at Claremont Road. He had scored a hat-trick in the League in a 6-0 win at Clapton in that September and signed off for Hendon with a double against Staines Town in the Middlesex Senior Cup on 6 February 1971. His Luton Town debut came just seven days later. The second Peter Anderson joined Hendon from Ilford in July 1976. A tall, thin defender, Peter looked like a centre-half, but was equally accomplished at right-back, where he spent much of his Hendon career, Alan Campbell and Peter Deadman claiming priory in the middle of the back four. That Hendon defence, left-back Gary Hand was the other member, was one of the best in non-League football, and, maybe a fourth-place finish was disappointing, but Hendon have only twice finished higher than that since 1974. Stopping goals is the prime concern for defenders, but Peter and Alan together scored 12 goals in Peter's first season at Claremont Road. They managed an astonishing 17 - neither was a penalty-taker - the following campaign. Peter missed only four League games in 1976-77, one of which came after he helped the Greens to win the Middlesex Charity Cup. He suffered a cut to his head that bled so profusely that three separate attempts to staunch the flow of blood failed and when his white shirt became almost as red as the Uxbridge ones, the referee effectively ordered him off. It would be the first of two medals Peter won that season as he was part of the team which won the Isthmian League Cup with a 1-0 defeat of Barking at Earlsmead. The following season was a disappointment as Hendon slipped to 13th in the Isthmian League but they did reach the first round proper of the FA Cup, losing 2-0 to Watford, and came up short in both the Middlesex Senior and Charity Cup finals. Peter won his second Middlesex Charity Cup winners medal the following season, as a substitute against Harrow Borough at Earlsmead, his last cup final for Hendon. In fact cup and League success was pretty thin on the ground in the latter part of Peter's career, and his absence in the FA Cup first round proper replay defeat away to Wycombe Wanderers was key to the Chairboys' success. Peter did play in the Greens' first ever venture onto Astroturf, the 5-1 defeat of Taunton Town at QPR's Loftus Road ground, and he scored the final goal, too. Sadly, Peter's Hendon days ended just a few weeks later when spending cuts resulted in senior players being released following the FA Trophy defeat at Witton Albion. The FA have released the early draws for the FA Cup, FA Trophy, FA Vase and FA Youth Cup this morning. In a change to recent years, the FA Cup has only been drawn up to the Preliminary Round stage, meaning that we will have a wait to see who we are playing. We enter in the 1st Qualifying Round which takes place on the weekend of Saturday 12th September. In the FA Trophy, we also being in the 1st Qualifying Round, and we have been drawn at home to Barton Rovers or AFC Sudbury. This will be played over the weekend on Saturday 31st October & Sunday 1st November. The actual date will be confirmed in due course as Harrow Borough have been drawn at home to Dulwich Hamlet. In the FA Youth Cup, we have a bye in the Preliminary Round, and will travel to Beaconsfield SYCOB in the First Qualifying Round during the week commencing Monday 21st September. We are delighted to announce that Brent Council unanimously approved the plans to develop Silver Jubilee Park at tonight's planning meeting. This means that Rob Morris and his team can now move forward with all the work that is required to bring the ground up to the right standard for us to be able to play there in the Ryman League. The club would like to thank Rob for all the hard work he has put in with the planning application, and all the associated work at SJP, and we all know that he will continue to work tirelessly to ensure the club are able to move in sooner rather than later. Admission prices for our three home friendlies have been confirmed. The games at Silver Jubilee Park against Northwood on 11th July and Haringey Borough on 21st July will both be £5 for all adults, and free for under 16s. Gary McCann's Testimonial at Earlsmead against the QPR XI will be a pay what you want game. Walking Football, a slow-paced version of the beautiful game aimed at the over 55s, has arrived in Middlesex with venues popping up all over the County. Walking Football is designed to help people keep an active lifestyle regarless of their age, as well as getting individuals back playing football who had to stop due to injuries. As the name suggests, Walking Football is non-contact and anyone that sprints, runs or jogs while the ball is in play will be penalised with a free-kick awarded to the other team. The game is played on a pitch 20-40 yards in length and 15-30 yards in width with a size 4 Futsal, with the game restarted via a kick, roll or throw-in. Plenty of breaks for stretching and water occur and a full medical screening process is advised. Starting at SJP in July! If you are interested please contact the club on admin@hendonfc.net.